2004 establishing of the "Pohl-Ströher Mineral Foundation"
At the end of 2008 opening of the exhibition terra mineralia, a permanent exhibition of the TU Bergakademie Freiberg. Since the opening nearly 1,000,000 visitors from all over the world. 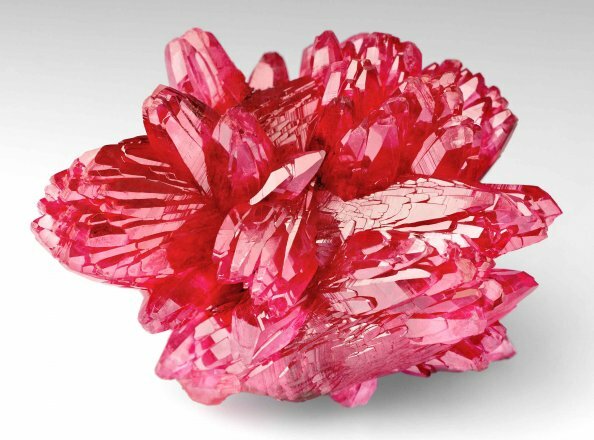 Rhodochrosit, N Chwaning Mine, Kuruman, Northern Cape, Südafrika, 6,5 x 3,5 x 4,5 cm, Foto: Jörg Wittig, Dresden. Fluorit, Dalnegorsk, Primorski Kraj, Ferner Osten, Russland, 10,5 x 8,5 cm, Foto: Jörg Wittig, Dresden. Pyrit und Quarz, Morococha, Junin, Peru, 15 x 8 cm, Foto: Jörg Wittig, Dresden. Amethyst, Bolivien, 13 x 13 cm, Foto: Jörg Wittig, Dresden. 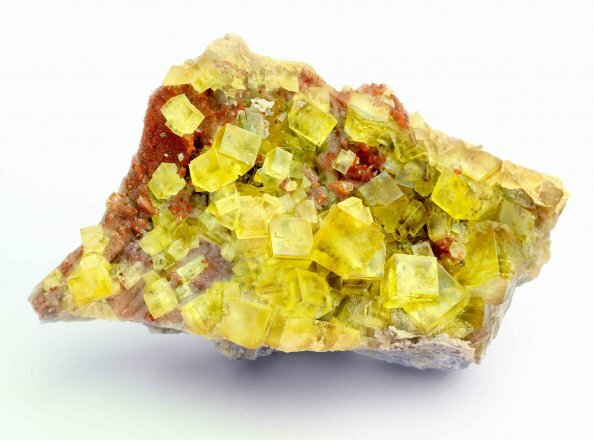 Fluorit, Aouli, Meknes-Tafilalet, Marokko, 14,5 x 8 cm, Foto: Jörg Wittig, Dresden. 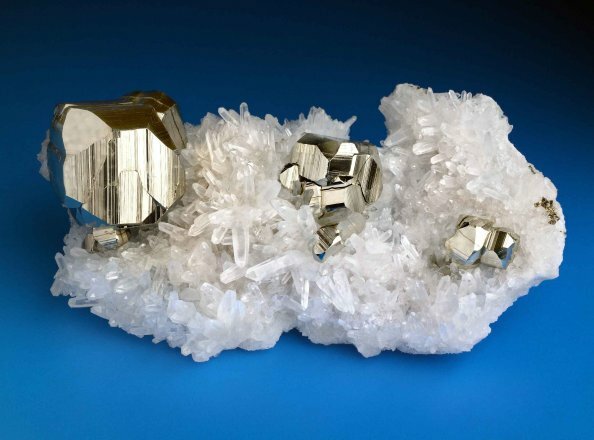 Dr. Erika Pohl-Ströher collected the minerals in her collection over a period of more than 60 years. The specimens are arranged according to geographical regions. Considering that Dr. Pohl-Ströher had no intention of exhibiting her mineral collection and therefore did not make a conscious effort to ensure that she obtained specimens from all over the world, she has succeeded remarkably well in setting up an extensive, comprehensive and magnificent collection that includes minerals from every continent. Her main interest was in collecting crystals which were beautifully shaped and diverse in colour, rather than impressively large. She therefore paid great attention to aesthetic formations, which has resulted in a collection of great beauty. Dr. Pohl-Ströher’s collection grew especially during the time when those responsible for the Freiberg Mineralogical Collection only had limited possibilities to obtain new specimens. During the German Democratic Republic era, the people of East Germany had very limited opportunities to travel to important mineral sales exhibitions in order to purchase new specimens, and neither were there any funds available with which to purchase such wonderful specimens as those that were being avidly collected by Dr. Pohl-Ströher at the time. 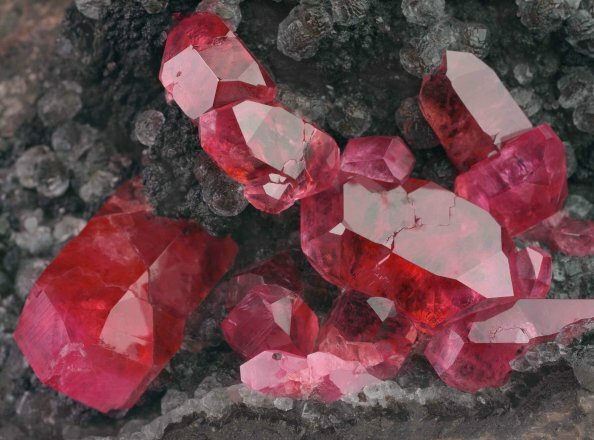 Fortunately, they were able to complete their collection of systematic minerals, thanks to an international system of bartering, but it was almost impossible to obtain specimens of the same excellent quality as those that Dr. Pohl-Ströher had. Her private collection has therefore complemented and enlarged the existing, scientifically important, Geo-scientific Collections of Freiberg Alma Mater enormously. This donation has been a unique and excellent opportunity for the University to obtain such excellent material, because even today, financial resources for purchases are very limited. A large portion of Dr. Pohl-Ströher's collection consists of show-pieces of the highest quality. The richness of colour and the shapes of the excellently formed crystals overwhelm visitors. These magnificent minerals from all over the world are a delight for laymen and collectors alike. The collection consists of both historic and new collection sites. The minerals shown at terra mineralia are provided by the "Pohl-Ströher Mineralienstiftung". In 2004, the native of Saxony Erika Pohl-Ströher decided to give her unique collection as a permanent loan to the TU Bergakademie Freiberg. The collection of Dr. Erika Pohl-Ströher is regarded as one of the most valuable and significant private collections worldwide. At terra mineralia the precious specimen are permanently on show for the public since October 2008. Spessartin, Mina Navegadora, Conselheiro Pena, Minas Gerais, Brasilien, 3 x 2,25 cm, Foto: Jörg Wittig, Dresden. 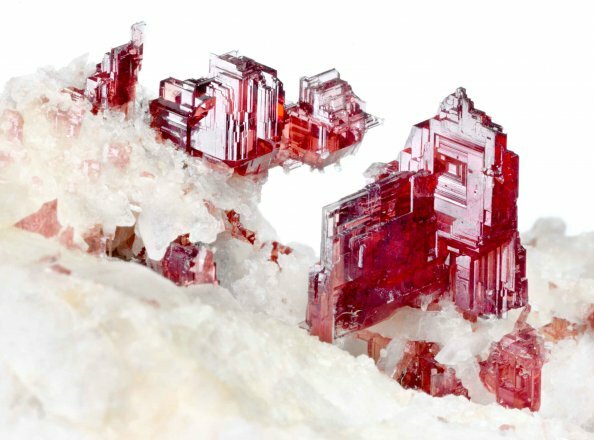 Rhodochrosit, Uchucchacua Mine, Lima, Peru, Bildausschnitt: 5,5 x 4 cm, Foto: Jörg Wittig, Dresden. Shortly before Christmas 2016, we received the sad news here in Freiberg that Dr. Dr. h.c. Erika Pohl-Ströher had died at home in Ferpicloz on the 18th December 2016 at the age of 97. 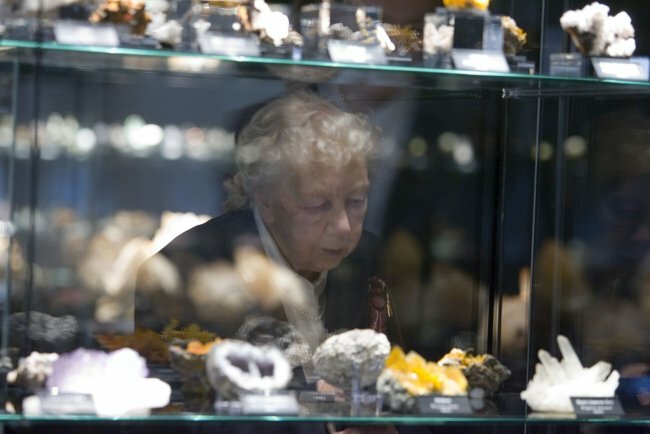 With her passing, TU Freiberg is losing a patron who, through the permanent loan of a large part of her mineral collection to the university, facilitated the establishment of the world-renowned terra mineralia exhibition in Freiberg Castle and the Mineralogical Collection Germany in the Krügerhaus. These visitor magnets have welcomed over 850,000 people since 2008. Within the space of a few years, the entire area around Freudenstein Castle changed into an attractive part of the Freiberg urban landscape. The collection enriches the university’s teaching and research in a unique way. Erika Ströher was born on 18 January 1919 in Wurzen in Saxony and grew up in Rothenkirchen in Vogtland. Her life was significantly shaped by the company Wella, whose foundations were laid by her grandfather in 1880. Erika Ströher studied chemistry and biology in Jena, and obtained her doctorate in biology. 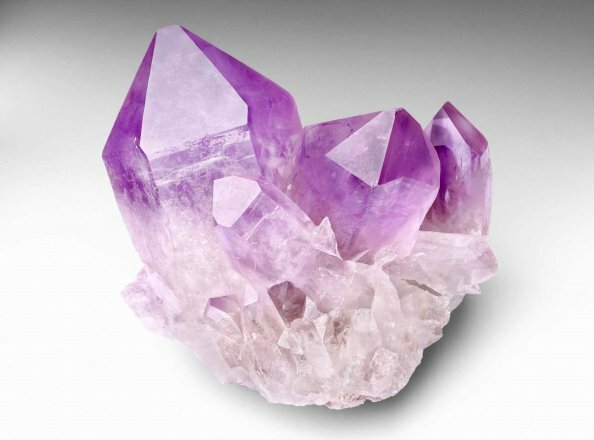 From a young age, she was also interested in minerals – while visiting the spa in Bad Gastein, she was taken with the beautiful quartz souvenirs available there. She began to collect periodically. It was only after the children left home that she became a passionate collector – following minerals from the Alpine region, the Ore Mountains and other regional sites, she turned her attention to Eastern Europe, Africa and America. From the mid-1990s, her main interest was in mineral deposits from China, Pakistan and Afghanistan. She brought together more than 90,000 specimens from across the world. In this way, she built up an extensive collection over 6 decades, organised by regional criteria and characterised by its premium quality and aesthetic appeal. Dr Erika Pohl-Ströher developed an international network of exchange partners and dealers across the world, constantly receiving details of exceptional mineral discoveries. In this way, she was able to continually add new and attractive specimens to her collection. In order to preserve her life’s work, she and her children sought a suitable venue to exhibit her collection, where a majority of the collection could be displayed taken care of, but also used for scientific research and teaching. On account of the TU Bergakademie, the choice was made in favour of Freiberg. 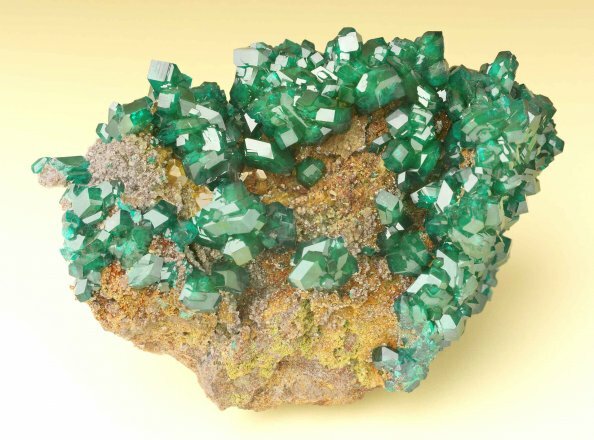 In 2004, the green light for the terra mineralia exhibition was given with the founding of the Pohl-Ströher Mineral Trust in Switzerland and the conclusion of a permanent loan contract with TU Bergakademie Freiberg. Through the renovation of Freudenstein Castle a special venue for exhibitions and events was created and opened at the end of October 2008. Those treasures not on display are stored in a spacious depository where they are permanently accessible for research purposes. At the end of 2012, the Mineralogical Collection Germany in the Krügerhaus was completed. Throughout the entire duration of our partnership with Dr Erika Pohl-Ströher, what impressed us most was her humility, reserve and warm-heartedness. One of our donor’s greatest desires was to inspire as passion in young people in particular for the natural and geological sciences through the presentation of her minerals. She regularly kept up with news about the development of our exhibition and contributed her own ideas as well. She was especially delighted when the ‘mineralinos’ kids’ club was established and a variety of school and holiday programmes were developed. With 350 school groups per year and over 1,000 day visitors to our holiday initiatives, the programmes have enjoyed great success. We are pleased to have been able to fulfil our donor’s wishes. Dr Pohl-Ströher received numerous honours for her commitment to the geosciences. In 2004, she was awarded the Stein im Brett by the Berufsverband Deutscher Geologen (Association of German Geologists). The Free State of Saxony awarded her the Saxon Order of Merit in 2005 and TU Bergakademie Freiberg named her an honorary member of the university senate. In 2008, she received an honorary doctorate from TU Bergakademie Freiberg’s Faculty for Geosciences, Geotechnical Engineering and Mining. 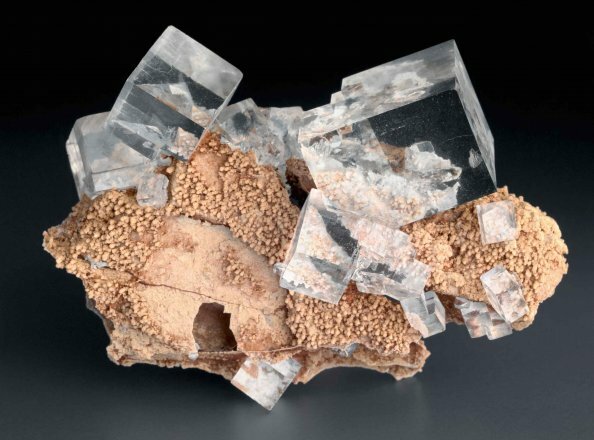 In 2013, a new and very rare hydrous copper zinc calcium arsenate discovered at Dr Pohl-Ströher’s favourite site of Tsumeb in Namibia was named Erikapohlite after her. The world of minerals wasn’t her only interest, however. She also established two further exhibitions in the Ore Mountains, not far from Freiberg: the interactive museum Manufaktur der Träume (Factory of Dreams) in Annaberg-Buchholz from her collection of Ore Mountain folk art and crafts, and the Pohl-Ströher Repository in Gelenau, where folk art, historical toys and Christmas and Easter items are displayed twice a year. We will always honour her memory and legacy. Schorl is a black tourmaline that is classified as a gemstone. The name is derived from the sight of its discovery, Zschorlau in the Ore Mountains of Saxony. In the 15th century, it was already being mined in the area, together with the tin mineral cassiterite. The tourmaline is black because of the iron stored in its atomic lattice. 20 x 18 cm; Photo: Jörg Wittig, Dresden.